Miss Darcy just wanted to remind you that July 29th is the last day of the Summer Splash Blog Hop. What a delightful way to begin the last week of July. You’ll meet 48 independent authors and have a chance to win a Kindle Fire and other grand prizes. Some of these authors may be old friends but it is also an opportunity to meet authors who are new to you. Miss Darcy is aware you are anxious to learn about the 2013 Summer Splash Blog Hop and her own giveaway prizes. To enter Miss Darcy’s contest to win a $10.00 Amazon gift card and to hear the rest of the details CLICK HERE! And after you’ve entered to win at Miss Darcy’s page check out the rest of these amazing chances to win at the 2013 Summer Splash Blog Hop main page! Have a wonderful day of hopping and I hope you’ll win lots of prizes! "This is Regency romance at its best. Karla Darcy’s books are simply magical. Her stories have everything I look for in this wonderful genre: wit, humor, intrigue, and tenderness. You’re in for a treat." 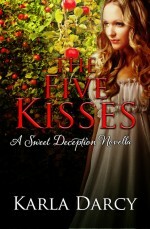 to Miss Darcy's blog, and get The Five Kisses FREE!